July 31, 2017, 1:30 PM · Applications are open for the second-ever Singapore International Violin Competition, which will take place Jan. 28 through Feb. 8, 2018 at National University of Singapore's Yong Siew Toh Conservatory of Music. 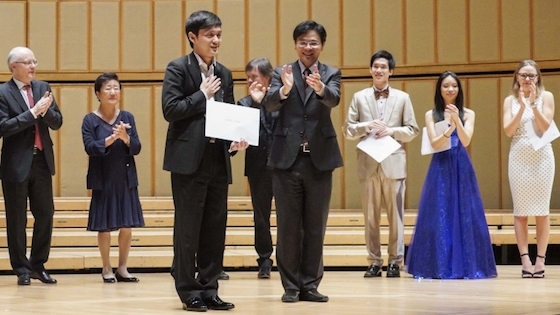 Yu-Chien ‘Benny’ Tseng accepts First Prize at the 2015 Singapore competition. The triennial competition is open to violinists age 30 and younger (born after Dec. 31, 1987), with prizes totaling $110,000 USD as well as international concert opportunities and a violin loan from The Rin Collection. Jury members will include Qian Zhou (Chair), Mauricio Fuks, Kam Ning, Kim Nam Yun, Boris Kuschnir, Silvia Marcovici, Paul Roczek, David Takeno and Viktor Tretiakov. The inaugural competition took place in 2015, with laureates including Yu-Chien ‘Benny’ Tseng (First Prize); Richard Lin (Second Prize) and Sirena Huang (Third Prize). The deadline for applications is September 30, 2017. Click here for the application page.